Today I won’t be saying TGIF, because today and this weekend I will be moving out… From the West Village to the East Village is kind of a big deal in this city and I am not looking forward to all the heavy lifting over the next few days. There’s about 10 large boxes in my living room just waiting for me to begin filling, so wish me luck! We wear short shorts- in the summer, in the winter, with tights, and with boots.. We wear them embellished with studs, ripped and destroyed, acid-washed, and bleached just the right amount. Denim shorts have been around, well, for a long time, and have evolved with us and because of us. They’ve gone from high-wasted, to low-cut, and back to high-wasted. Different washes and ways to destroy these shorts while still being very wearable have been created to make jean shorts a staple in fashion. We don’t expect everyone to understand the “destroyed phenomenon”, and it’s definitely hard to explain why we love to wear only the most beat-up and washed-out looking denim to our elders. But, when worn with the right outfit, a pair of these shorts can look edgy and fashionable. They can create that perfect rocker look, indy vibe, or 70’s style. My go to denim brand is hands down the Australian rebells One Teaspoon. Get yourself a great pair, it’s a must. Yesterday I stopped by The Vintage Twin Trunk Show on 23rd st and picked up this little number. I’ve never been a skirt girl, but come on guys – it’s leather and studded. I’m also wearing a new pair of clear sunnies I got from Urban Outfitters and have now realized that my collection has grown to a whopping 30 pairs. Yes, this means I will be working on a video post sometime soon to show you my hoarding skills when it comes to snazzy eyewear. Yesterday the cooler-than-I’ll-ever-be Miss Handly (Destinee Handly) graced me with her presence and gave me some summer nail art. The up and coming nail artist has done everything from chain-mail manicures to patriotic tips with skull art. Seriously, she can do everything. 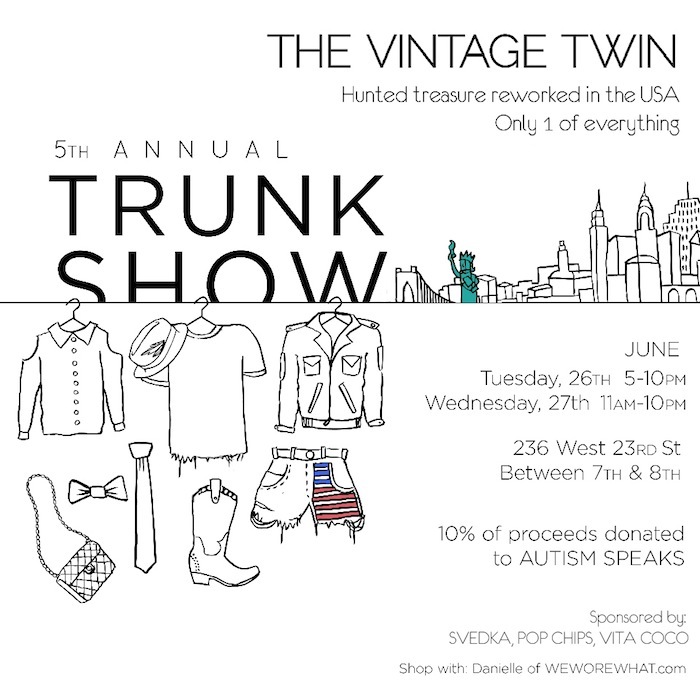 My relationship with vintage has found its perfect date – The Vintage Twin TRUNK SHOW! Now if you don’t remember my blog post on my first encounter with the girls behind the vintage, then let me remind you of how awesome it was HERE. So, tomorrow and Wednesday they will be selling the hunted/re-worked treasures they’ve been keeping for themselves all this time, and I’ll be there too! Come hang on Wednesday from 6-10pm and shop with me – maybe even get invited to our exclusive after party too! Remember, there’s only ONE of everything!